Bianca Andreescu’s dream start to 2019 continues. The 18-year-old, who made waves across the sport following inspired efforts at the ASB Classic and Australian Open earlier this month, caps off a brilliant January with her biggest title to date at the Oracle Challenger Series event in Newport Beach, California, a WTA 125K tournament. Andreescu overcame resurgent American Jessica Pegula in three sets, 0-6, 6-4, 6-2, an impressive effort considering her nearly-three-hour heroics less than 24 hours ago against Tatjana Maria. Fatigue from that 5-7, 7-5, 7-6(3) semi-final win was fully evident in the first set, as Pegula blew through Andreescu with a combination of bludgeoning groundstrokes and deft drop shots, which succeed in throwing the Canadian off balance early on. In the second set, however, Andreescu would rebound spectacularly. With a better read on 24-year-old Pegula’s patterns of play, Andreescu would summon the versatile play that saw her claim wins over Caroline Wozniacki and Venus Williams to start the season. After edging out the second set, the third was all Andreescu and, after one hour, 37 minutes of play, the Canadian earned her most prestigious title to date. That title-winning moment. 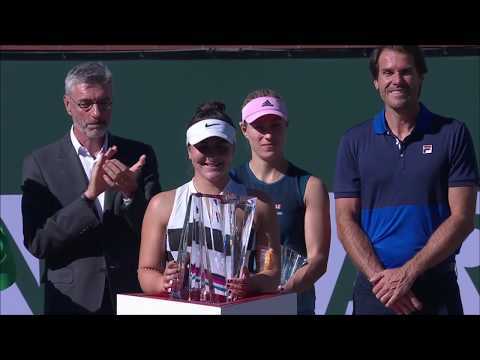 The PERFECT way to cap off a life-changing January for @Bandreescu_. The win not only sees the Mississauga native’s ranking soar into the Top 70 (she was outside the world’s Top 150 to start the season), but it also sees her supplant Genie Bouchard as Canadian No. 1 in women’s singles. With both her rapid rise and Bouchard’s apparent return to form, the future of women’s tennis in Canada is looking bright as ever.